September 10, 2018. Scientific seminar of the laboratory of geodynamics took place in the Belousov hall of GC RAS. I. A. Sdelnikova made a presentation "Spatial-temporal variations of deformation processes in subduction zones" on the basis of her PhD thesis. 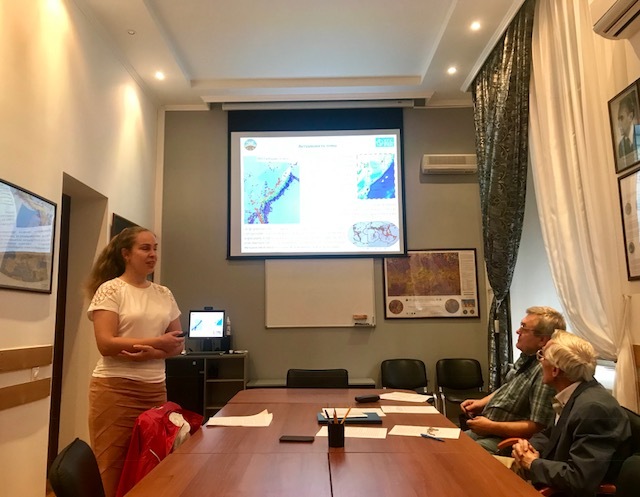 The thesis of Irina Sedelnikova is aimed at studying deformations in subduction zones and revealing their features at different stages of the seismic cycle on the basis of satellite geodetic data. The relevance of the study is determined by the high seismic activity, as well as the tsunami hazard of the subduction regions. Catastrophic earthquakes occur in such areas.